A nice big fish is something I will eternally associate with Summer chez moi. I have brilliant, sparkly memories as a child of going on summer holiday to the ocean and over dosing on good sea food. South Africa has, if you ask me, some of the best sea food in the world and I look forward with glee to a trip back to my birth country and a seat over looking a pounding surf with a plate of fresh fish and chips. 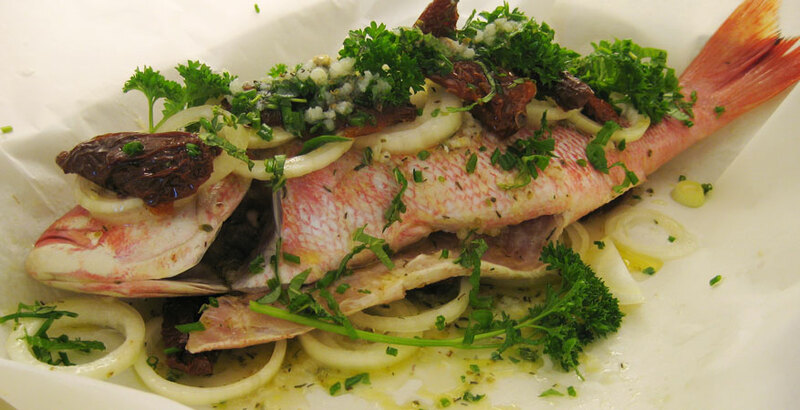 One of my favourite fish to cook at home is a snapper, preferably whole. Now, bear in mind that this is a bony little sucker, so I wouldn’t necessarily recommended it as a first date type affair. There’ll be plenty of sucking and plucking and chucking with this on the plate. But a whole fish is still a great way to go for a barbecue, or in the oven, as convenience allows. Getting your fish from a fish monger is the beat way to go, if you can. You can pick the best fish and have it cleaned and descaled while you wait. Fish doesn’t last, even in the fridge, so either freeze the sucker or eat it same day. Start by rinsing the fish, inside and out, and pat dry with a paper towel. Rub a little olive oil on the skin and season with a bit of salt. 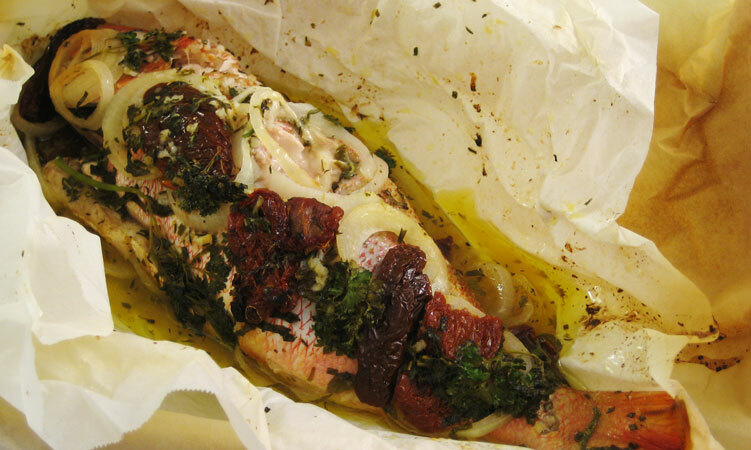 Lay a piece of parchment paper large enough to completely wrap the fish in on the counter. Slice up a large onion and place half of it on the middle of the parchment. Chop up 5 or 6 sun dried tomatoes and throw these on top of the onions. Now grab a handful of fresh herbs, what ever you have. I used a big bunch of parsley, some basil and tarragon. 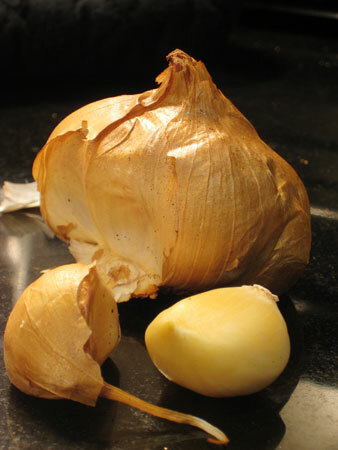 Mince a big clove of garlic, chop the herbs up, mix the two and put half of this on the onion tomato base. Put the snapper on top of this mix and repeat the layer: onion, tomato and herbs. Drizzle the whole shebang with olive oil. Wrap the fish up in the parchment, securing with some string, and bake for about 15 to 20 minutes until the flesh is just flaky. Let the fish sit for a couple of minutes before serving with a good garden salad. As our temperatures here in Toronto start to dip and dive again in the face of Autumn I keep thinking about all the gorgeous food I cooked up over the Summer and never got around to sharing with you. So, over the next little while, you’ll have to bear with me as I turn an uncharacteristically unseasonable page back to the hotter months and post some of the recipes and cook ups that got lost in the comings and goings of all the travelling I did over that time. Hopefully I’ll manage to get up to speed with the backlog before the glories of autumn are over with, or I’ll find myself a season behind when spring finally comes around and I’m still stuffing butternuts and mulling apple cider. A lot of the time in Summer the last thing you want to be doing is keeping an eye on a slow cooking stew or spending hours in the hot, sticky kitchen. Summer over here at Lick Your Own Bowl is often a casual, quickly thrown together meal of the season’s freshest produce, herbs from the garden and a long, candle-lit evening sitting outside in the garden with the scent of flowers and barbecue in the air. 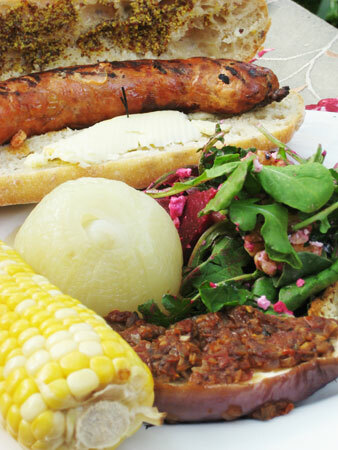 There’s not much too say about this Summer-Coloured meal. 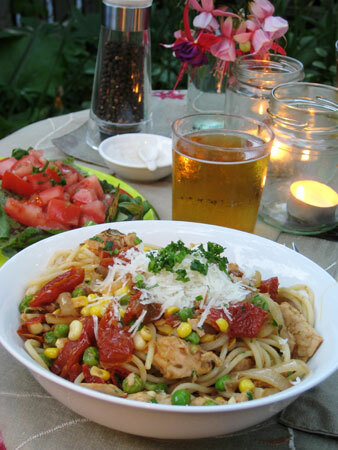 A quick sticks pasta, with sauteed onions and garlic, sundried tomato, fresh Ontario corn and peas, lightly cooked and deglazed with a dollop of white wine and then plucked up with a bit of white tuna and washed down with an ice cold lager and a side of fresh salad is just heavenly. Then sit back and listen to the crickets and the laughter of neighbourhood kids still playing street hockey in the road. The Summer in Toronto is one of the lustiest, I think, in the world. Those steamy, heat-hazy, lazy-crazy, long-limbed days that wrap their humid, whispering tendrils around your bare throat and exposed shoulders do something inexplicable to this city and the people in it. The girls, the boys, the dogs, the ducks: no one escapes the sensuality of it, we are all susceptible to Summer’s hot, sticky embrace. But before we completely lose our heads to this love affair there is, as in any meaningful, dirty little tryst, the courtship; the tease, the tempt, the flirt and the fluster. A few gorgeous, sunny days sauntering by our Wintery table at the end of April have us shaking out our hair in false hope of an early Summer, only to be firmly reminded that we are the flirtee, not the flirter, by a cold shoulder for half of May as we look longingly at our Summer wardrobes and the pretty, colourful mannequins in store windows. And then, slowly, almost painfully, just when you think she’ll never notice you, that she has eyes only for the muscular, deep tan muscles of Texas, she. Stops. And turns that beautiful, golden head and looks you straight in the eye. 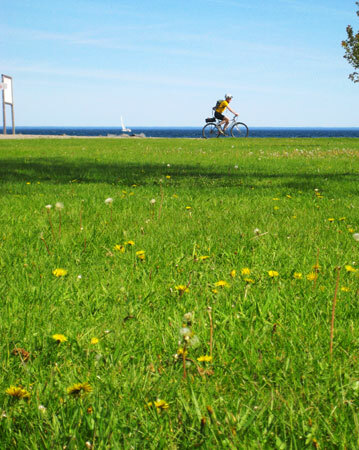 The Glory that radiates from Summer’s eyes envelopes us all, does it not? But now that she’s seen you, now that you finally have her attention, how can you, such a humble little creature, keep that gorgeous gaze locked firmly with your own. How to impress such a fickle lover, you ask? Why, with a barbecue, of course. If you cook up the coals just right, who knows, she may just stay for dessert. I made these eggplants for a dinner party the first time, baked for about 40 minutes at 350˚F and had a bunch left over when we decided to open up the Weber . Wrapped in foil, they were just so good and the left overs were somehow even better the next day when I removed the skins, spread the pulp and topping on toast and grilled with some gruyere in the oven for a couple of minutes. 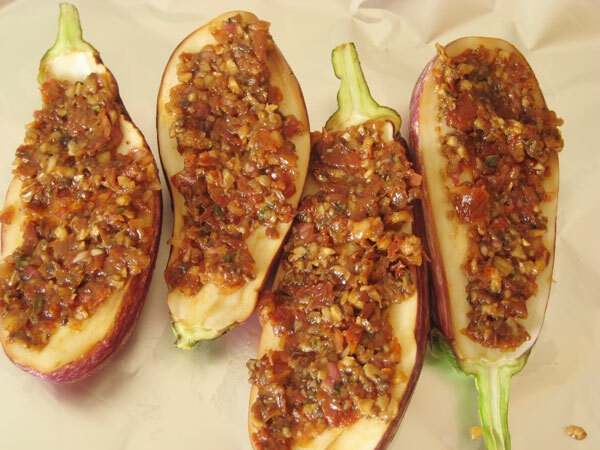 * this recipe makes enough for about 5 or 6 baby eggplants. Adjust accordingly. 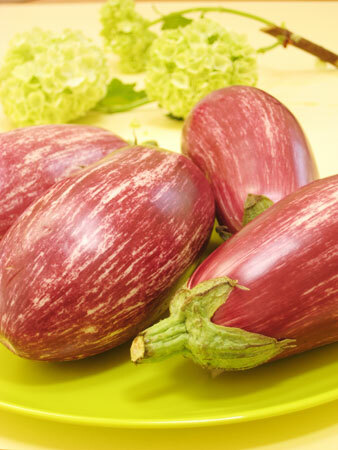 – cut the eggplants in half and salt generously. Leave for an hour or so at room temperature. Rinse and pat dry. 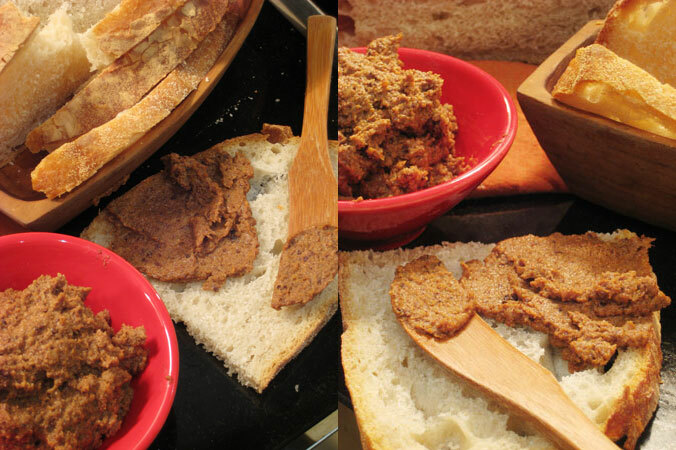 – place all ingredients (except eggplant) in a processor and blitz until finely chopped (or chop it all by hand). Season and add enough olive oil to for a thick, chunky paste close to but drier than a pesto. Allow it to sit for 45 mins to develop. 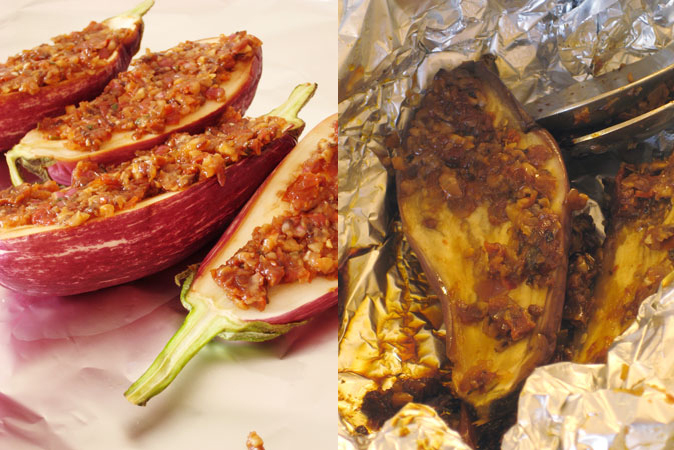 – place eggplant halve skin side down on enough foil to fully wrap them ein. Top with tomato mushroom mix and barbeque for about 30 minutes on the rack. 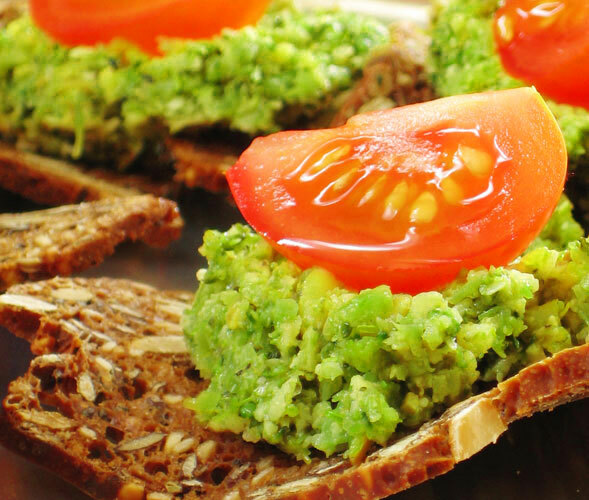 – serve with a generous amount of sunshine and chilled beverages. Being a busy and sometimes flustered new puppy owner, ahem, I’ve been limiting my cooking to the realm of Quick and Easy. While juggling work deadlines, puppy feeding and copious sweeping, mopping and tidying of floors and fur I’ve had little energy left for elaborate and fussy dinners and lunches. And while I’m looking forward to the day I’m back at the fuss and elaborations, for the moment I’m quite content to pull a dinner together from that which lurks at the back of the pantry. 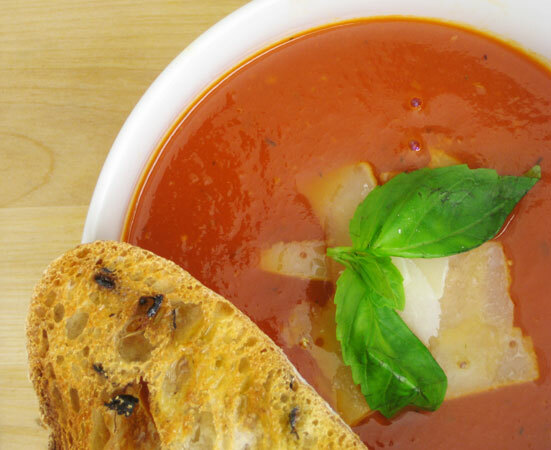 This tomato soup is a perfect compromise of needing to embrace a fresher palate for the wonderful, warm Spring weather we’ve been having and a no fuss, quick-as-you-like dinner, taking 15 minutes from can opener to toast dunk. This is a perfect amount for two, so double up if you want left overs for lunch or to feed more people. – heat oil in a medium saucepan. Gently saute garlic until fragrant, then add herbs, fennel and tomato paste, saute for about a minute. – add tomatoes, juice and stock. Bring to the boil and simmer for 5 or 6 minutes before seasoning to taste. – Remove from heat and blend until smooth. 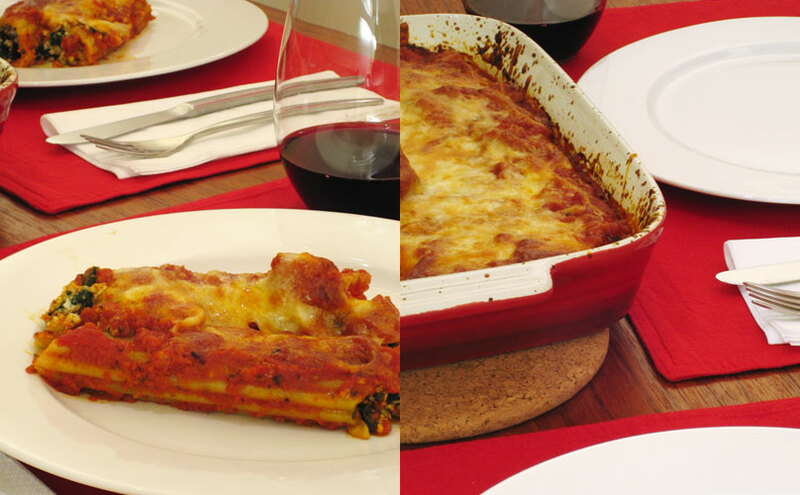 Manicotti are much larger than cannelloni and therefore much, much easier to stuff. Personally, I approach the whole stuffing process with joyless abandon. Not for me the delicate process of cake forks and backs of teaspoons to get the stuffing in the tubes; it’s a roll up the sleeves, hands in the bowl affair in my kitchen. Although, I must confess, it was the ever resourceful Mr P who beat the prissy out of me one afternoon and a cannelloni stuffing competition, which he won hands down, if you’ll forgive the pun and since then I’ve followed his example. This is a lighter version of the usual pasta al fourno, foregoing the buttery bechemel in favour of an extra wop of tomato sauce. And that tomato sauce comes out of a jar, mind you. I don’t think I’ll be the type to be making bathtubs of my own tomato sauce any day soon and a good quality jar of ye olde tomato sauce does the trick perfectly. *I used provolone on the top because it’s what I had on hand, but a good mozzarella would be wonderful as well. 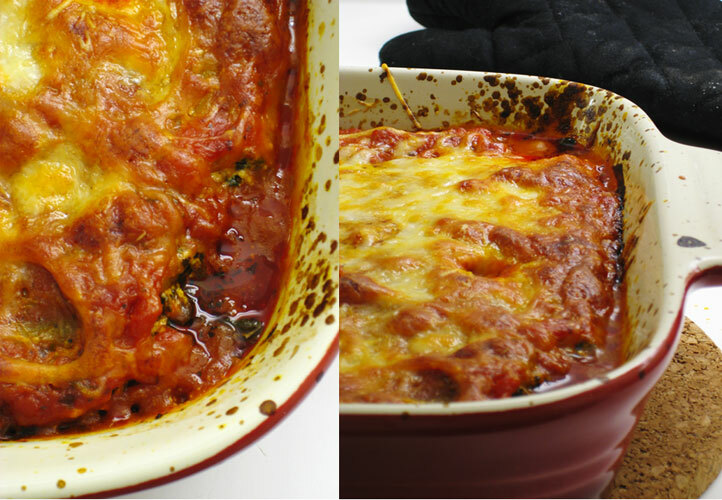 ** This recipe makes a full lasagna dish worth, enough for 4 – 6 people, so divide proportionately if you want, although it makes great left overs and freezes well too. – heat olive oil in a large skillet and saute onions and garlic until tender. Add spices and cook until fragrant. 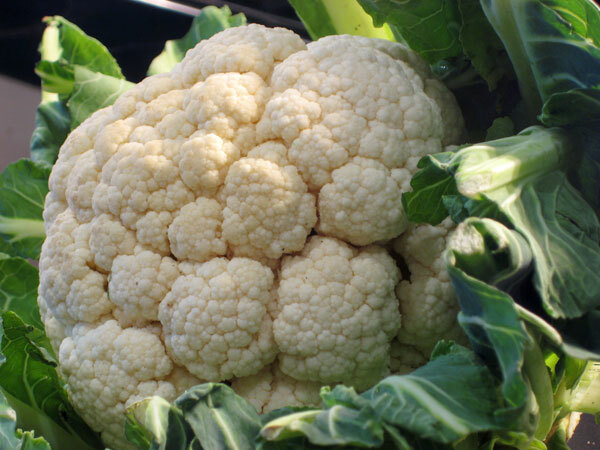 – add spinach in batches, to reduce size, and saute until wilted. Allow to cool for a few minutes. – transfer spinach mix to a large mixing bowl, add tomatoes, flax, olives, pine nuts and mix well. – mix in ricotta with a wooden spoon, breaking it up as you go to form a creamy mess. Season to taste. – spread about ⅓ tomato sauce on bottom of dish. 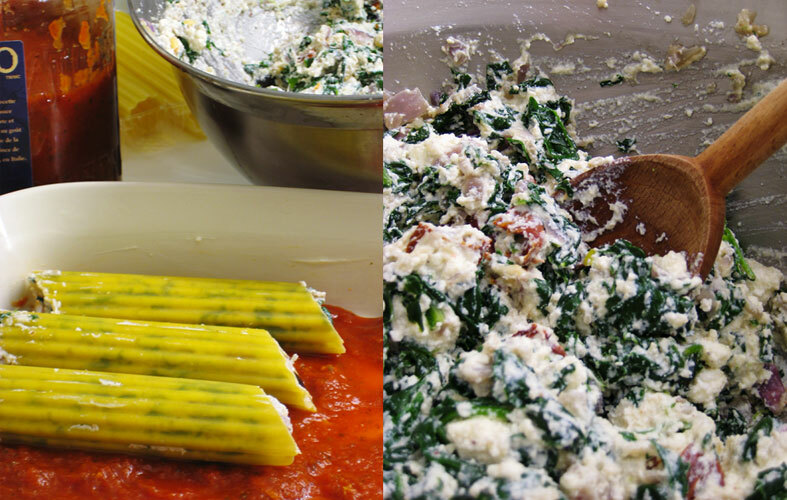 – stuff each manocotti with spinach filling and place on tomato sauce base. Continue until dish is full. – top dish with the rest of the tomato sauce and top with the two cheeses. 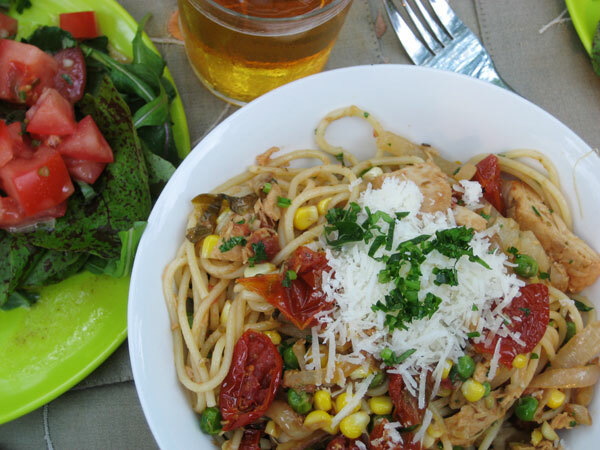 – bake in the oven for 45 mins, until pasta is tender. For a little dinner, which the dapper Mr P and I had with some fun friends last night, we decided to explore our decadent side a little with both a dessert course and a cheese plate. Is that a gasp I hear in the corner? Both dessert and Cheese? That’s crazy, I hear you yell. Crazy, yes. Delicious, definitely. But in order to survive such decadent and lavish behaviour, one must make sacrifices in the total volume of food presented. Therefore, an executive decision was made by the cook and her sous not to make an appetiser. Is that another gasp I hear behind me? No Appetiser? At a sit down dinner, a Winter dinner?! How barbarous! Ha. And you thought you knew me better. I did, however, think it rather uncouth to allow any guest our home to wallow in the joys of pre-dinner wine and conversation without just a little something to stay the hunger for a while. Enter the Amuse Bouche. Remember this little gem? Well, with a little twist of the Truffle-oil wrist and a sniff of apple cider vinegar added to the mix something that was already pretty darn good turned into something simply gorgeous. On an aside; that bottle of truffle oil given to me by the vivacious Mr W has been one of the best food gifts ever given. I’ve had a certain reluctance to ever buy one of those little, fancy bottles of truffle oil you see in speciality food shops on the basis that if I was going to ever eat a truffled anything, it was going to be a truffle omelet in the South of France in November one day. Some food experiences, in my humble opinion, should be saved for the Real Thing. Macaroons? I’m waiting for my next visit to Paris. Jamon de Bellota? The next time I find myself in the south east of Spain, I’m in. But until then, I’m quite happy to read about it, build up my expectations and tuck into some Prosciutto. So, I’d never even thought to buy a bottle of truffle oil here in Toronto but when dear Mr w cooked up an absolutely mouth watering penne with afore mentioned truffle oil, the aroma, the taste, the entire experience had me begging for more. The trick, it seems, as in so many things in life, not what you know but who. Knowing someone who makes there very own truffle oil from fresh truffles and sells it not in those dinky, if cute, little bottles for the price of your first born’s university fees but in a decent sized amount for an unpretentious amount is all it takes to convert me to the truffle side. Thank you, Mr W, you’re a gem.